Pack size: 2 x 60ml solution bottles, 2 contact lens cases & 1 travel zip bag. Review Renu MPS Multi-Purpose Flight Pack Very good quality! Review Renu MPS Multi-Purpose Flight Pack Perfect for travelling! Review Renu MPS Multi-Purpose Flight Pack I bought this pack just to test is this solution will suit me. i was glad that smaller containers were available for such situations. It worked very well, so ever since I'm using this particular cleaning solution for my contact lenses. Good for trips & holidays I hate having to carry round large bottles of solution for my lenses when I go away, not only are they heavy they nearly always leak on my clothes. Therefore I was happy to discover they sell my solution is this great sized travel pack. Would recommend to anyone who wants to travel light or carry solutions in their hand luggage. Good travel pack I needed a small bottle of contact lens solution I could take in my airport hand luggage and was very pleased to discover this. Solution works great, kept my lenses clear and clean. Also comes with handy zip lock bag so you don't need to get a clear bag at the airport. 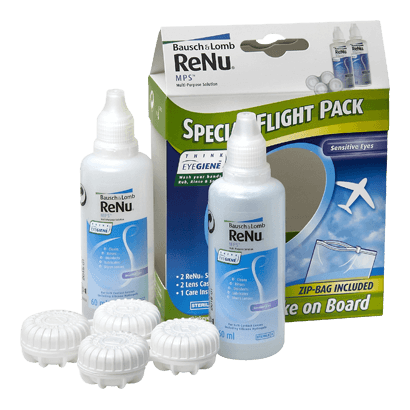 Sometimes it can be stressful to be stuck thousands of feet above the ground with dry eyes and impaired vision due to poorly cleaned lenses, which is where cleaning products like the Renu MPS Multi-Purpose Flight Pack comes in handy. Produced by reliable vision experts Bausch and Lomb, this pack specialises in cleaning soft contact lenses effectively and being superbly practical for international travellers. This is one vision product that no-one should forget to pack. • The Renu MPS Multi-Purpose Flight Pack includes Bausch and Lomb's popular Renu MPS cleaning fluid, which is relied upon by millions of lens wearers across the world. Providing clear vision without irritation, this will make in-flight movies a joy to watch. • Produced in a handy flight pack, this product includes two 60ml bottles, lens cases for safe storage and a useful zip up bag to ensure that nothing is lost en route. • Intended to be used with all soft lenses (including silicone hydrogel), the Renu MPS Multi-Purpose Flight Pack will deliver superb vision and practicality in an all-in-one travel solution. • Easily meet luggage requirements, and remove the stress from flying. Lens wearing does not have to be stressful. With this Renu MPS Multi-Purpose Flight Pack, you can hop on a plane confident that any vision problems can be tackled, so that you can see the sights in all of their glory.